the 100 greatest U.S. stamps. The outcome that is promised is a coffee table book to promote the hobby we love so dearly, a goal to be embraced and encourged. One is reminded of one who looked into a mirror and asked “Mirror, mirror, on the wall, who is the greatest one of all?” Okay, I’ve changed one of the words. If this were the sport of boxing we all would know the answer as to who is the greatest. His marketing machine told us. Now we are to hold up U.S. stamps in front of the mirror and ask the same question. I eagerly perused the “short” list of 149 and was disappointed to find only six revenue stamps. One could hardly argue about the inclusion of the $500 Persian Rug, (Scott R133). The stamp is visually stunning and the use of 10 of these stamps on a mortgage of the Morris & Essex Railroad probably puts it into the category of historically interesting and, arguably, important. On the surface, the inclusion of a stamp from the embossed revenue stamped paper section, such as RM18 (this is not an embossed stamp! ), seems logical on the grounds that this is one of the stamps intended to be used on pamphlets and newspapers under the British Stamp Act, one of the measures that is attributed to be a cause of the American Revolution. In fact this stamp’s use is not documented in the geographical boundaries of the present day United States. Because of the anger that spread in the thirteen colonies that would become the United States, it is highly unlikely that it ever, a goal to be embraced and encouraged saw use in the United States. But one can argue that its inclusion in the short list of candidates is merited on the grounds of historical importance. The Joyce collection contained two unused examples and two proofs that were made more than one hundred years after this stamp’s use. If this stamp is selected among the top 100 greatest, it will be interesting to see if the authors can find an example that was actually used for their illustration. 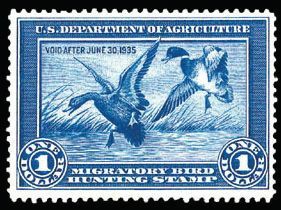 was so central to the initiation of the duck stamp program to raise funds for conservation. is the William E. Clark private die proprietary medicine stamp (Scott RS56). This is one of the two stamps issued for this same firm. It previously had been selected to illustrate the passage of Pure Food and Drug Act (1906) in the series of Celebrate the Century Series (Scott 3182f). Even the selection of this stamp for that series seems curious. The original stamp (RS56) was the second stamp ordered by the William E. Clark firm for use on Hunt’s Remedy, but the firm faded from existence about a year after the stamp was issued. Although the remedy made outlandish claims for cures, it almost certainly was no longer being produced by the time that the Pure Food and Drug Act was passed into law. There are other products that were more the target of the legislation that would have been better choices. Any of a number of them that included heroin or opium among their ingredients would seem a more appropriate choice for the postage stamp. Many of the private die stamps are visually stunning; many are more historically significant; several have interesting philatelic histories; some are immediately recognizable to those outside the hobby. If one were to define “greatest” in the context of U. S. stamps it would seem that four criteria should be included, the four criteria mentioned in my critique of the William E. Clark private die stamp. Using these criteria let us consider a few other revenue stamps that might have been included in the short list for greatest. 30, 1794. 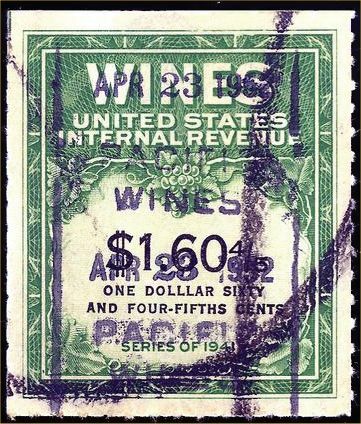 In exchange for reducing the rate of tax on domestic distilled spirits (to which the farmers in western Pennsylvania objected), the burden was shifted to the retailers of foreign products. The die for the embossed seal was created by Francis Bailey, the man who was the printer of many documents for the Continental Congress. 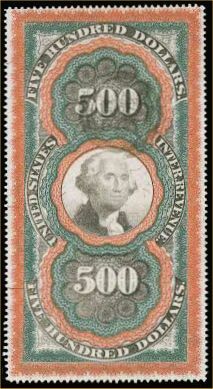 This stamp merits consideration on historical grounds and its status as the first denominated revenue stamp issued and used by the United States. A second stamp from the embossed revenue stamped paper section that might have been included is RM362. Like the one item selected from the embossed revenue category (RM18) this stamp too actually is not an embossed stamp. And curiously, it was issued by a state, not the federal government. 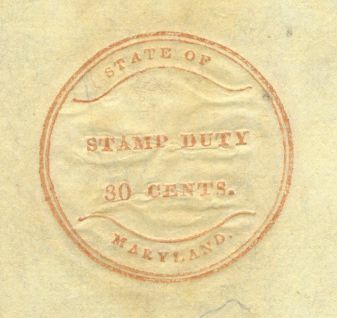 Maryland issued the stamp for circulating currency not issued by banks that the Maryland legislature had not chartered. 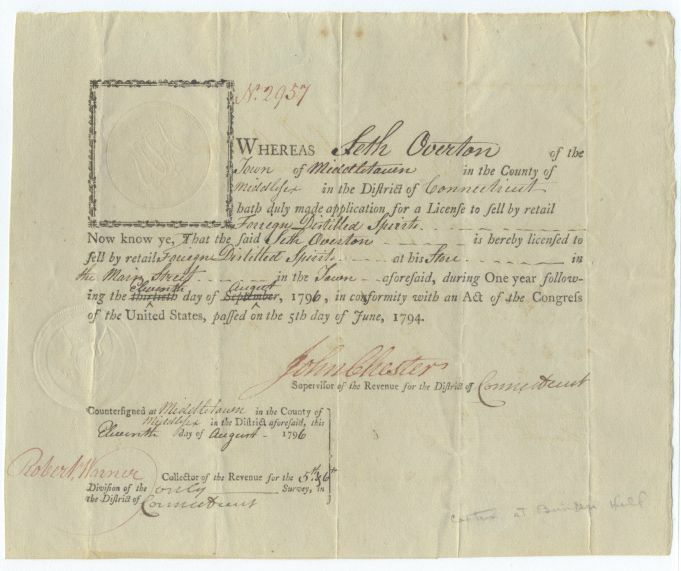 Only one bank would have been affected, the Baltimore Branch of the Bank of the United States, which had been granted its charter by the Congress. The state law was challenged by the bank and in an 1819 landmark decision the law was struck down by the U.S. Supreme Court, led by John Marshall. So the stamp was never used, but only this one denomination has survived in philatelic hands, a reminder of one of the series of andmark decisions of the Marshall court that defined the powers of the federal government. There are many revenue stamps that have interesting stories regarding their origins. Perhaps the most colorful story is the first third barrel stamp in 1867 Scott No. REA10). Beer stamps were first issued in 1866, the first stamps printed by the Note Printing Division of the Treasury Department, an office that a few laters would be renamed the Bureau of Engraving and Printing. The law specified that stamps should be issued for the following six sizes of containers: eighth, sixth, quarter, half barrel, one barrel (31 gallons), and 1 hogshead (62 gallons). The western brewers knew that mules could carry two third barrels, slung over the back of the animal, one on each side. Wishing to get as much beer up to the high Sierras as possible, the brewers petitioned the Bureau of Internal Revenue to add the third barrel to the list of permissible sizes. 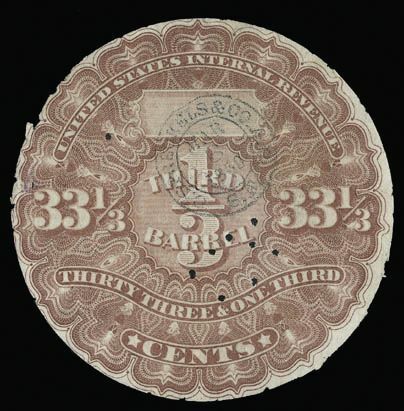 The third barrel stamp was added in 1867, a size that was continued to be printed in every series of beer stamps except the final Series of 1947, long after mules had been abandoned as the primary means of transporting beer up to the high Sierras to quench the thirst of the residents there. the incriminating evidence. In a curious twist about forty years later the U. S. Scott Specialized listing for the LLL error, corrected the misspelling in the description of this variety, a triumph(?) for the spell checker feature of word processing programs. 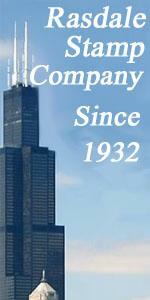 Too bad BEP did not have that capability in 1951!